I received access to this product for free and was compensated for my time only. All opinions are mine; I was neither asked nor required to leave a positive review. One of the first concerns about homeschooling high school that moms share with me is about teaching “those tough courses”: the advanced maths and sciences, primarily, but also those pesky lit and social studies requirements. Of course, as I’ve explained previously, it’s as important to know how/when to outsource classes as it is to know what curriculum you will use where homeschooling high school is concerned. But the wonderful thing about exploring these options is…well, that there ARE options! And this new tool by Study.com helps “us homeschoolers” take advantage of one of them. 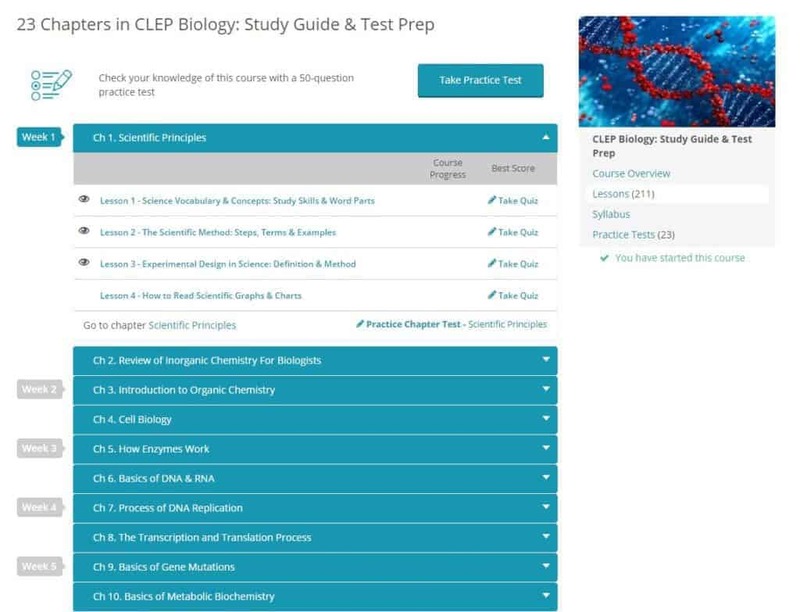 CLEP tests are exams that give you the potential to earn college credit without actually taking the college level course. They’re wonderful for advanced students who want to get a head start on their post-secondary learning, or want an extra bit of challenge. They can also be wonderful tools for those who want or need to reign in the future cost of their college studies. And in that aspect, they’re a wonderful complement to dual enrollment courses. Those, of course, do require a full semester of your time, however, but both options can potentially offer your wallet savings when it’s time to pay that college bill. Please note: it is super important to ask ahead of time whether your teen’s college of choice will accept CLEP credit. Not all schools do, and even those who may accept them might have limitations on the amount of credit or type of classes they will accept. Remember: due diligence is always important when homeschooling high school. But all that being said, Study.com has put together a wonderful online resource that provides true value to families who are tackling high school in their homeschool. With a range of features, they offer an impressive array of tools to help your student learn – and then get credit for – higher-level studies. 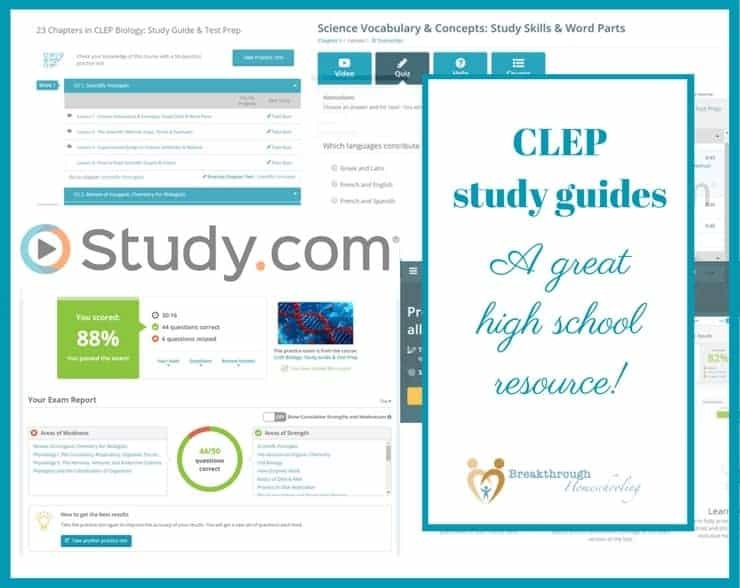 …and CLEP test prep help for you! Higher-level studies are often accompanied by a bit of the intimidation factor, especially when it’s your first time teaching “homeschool high”. So if you’re savvy (or anxious! ), you’re also on the lookout for something that can at least help you help your kids through the ropes, right? And as a busy homeschool teacher and mom of five, I’ve always appreciated simple. 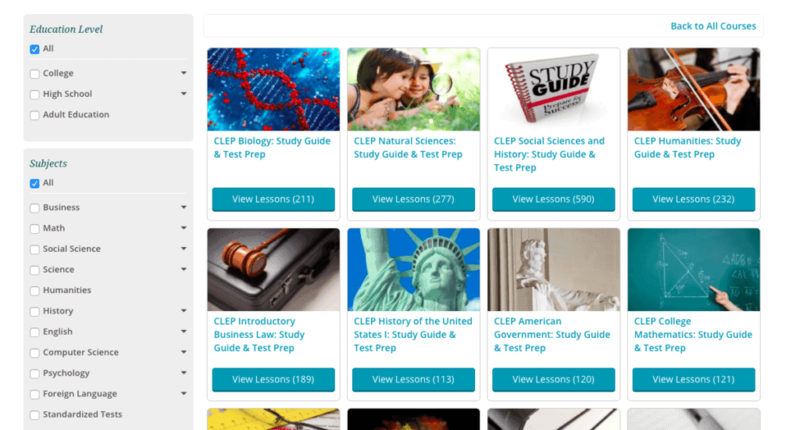 What I love most about Study.com’s product is how their features all fit together, so you can get access to CLEP courses, CLEP study guides and even CLEP practice tests all in one place! If students enroll in the College Accelerator plan, they can take proctored final exams through Study.com to earn college credit. They need to have their own individual account to do this, tho. So if you have a family with more than one student, each one who wants to earn credit will need their own account. To get the skinny, try out their free 30-day trial or call them at 855-777-4721 and talk to them directly. While you’re taking the course, a personalized study plan is crafted for you that will continue to help your student prepare until it’s time to take the exam. 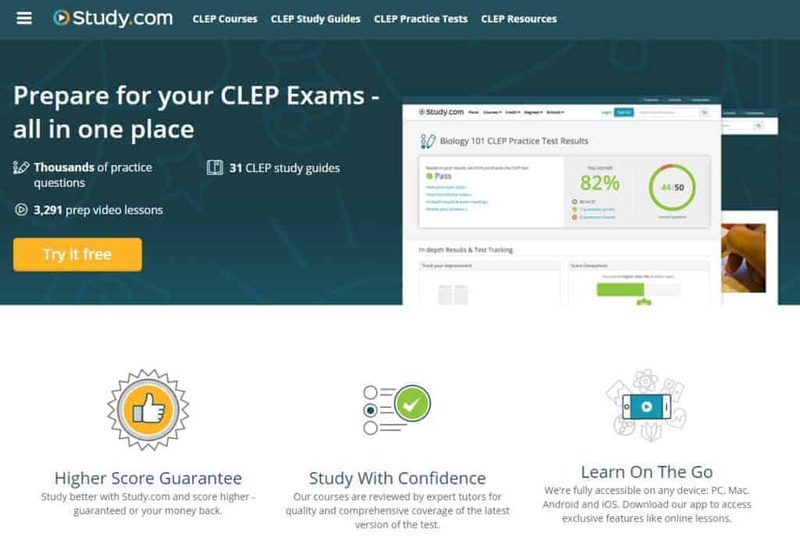 This study plan includes a mixture of CLEP study guides, videos, practice tests and more… Once you pick your exam test date, Study.com automatically creates the schedule to help your student stay on course, so you don’t have to. How helpful is that, right?! To paraphrase Tom Cruise, let me take a moment here to summarize and “show you the money”, so to speak 😉 Or, asked another way: what’s in it for mom? I have confidence in the resource: Study.com has a library of over 22,000 videos covering the 33 CLEP courses available and works with schools and colleges all across the U.S. I don’t have to worry about either the quality of teaching or level of material. I can be responsible without having to be hands-on: Just because you may have little ones running around needing your attention, or may have an outside job that you need to work around, doesn’t mean you want to short-shrift your high schooler, right? With Study.com, you can oversee studies without having to be responsible to create materials – a huge relief off this mom’s shoulders. 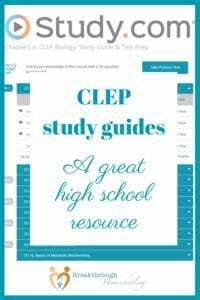 CLEP tests can save me money: While there is a cost to this resource, it pales in comparison to the bottom line we’ve gotten over the years from colleges our kids have applied to or considered. (This last one was almost $50k PER YEAR! And yes, we’re still waiting on our Financial Aid offer…) We’ve been a single income family for many years, and truth-be-told, minimizing college tuition spending is a very real consideration ’round these parts. ← #breakthrulinkup 22 – Keepin’ it real for you!